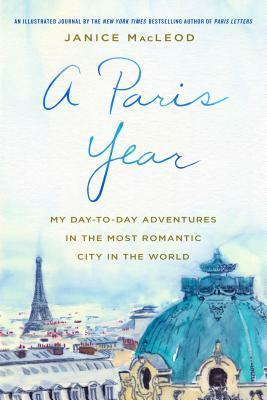 The style of A Paris Year is very similar to Paris in Love. Its written in snippets, journal entries, photographs and hand-drawn illustrations by McLeod. This is a great coffee table type of book. In this book, Macleod shares paintings, thoughts, observations and photographs from a journal she kept. There is something for almost everyday of the year. Each entry has the day’s Saint name (because each day in France has its own Saint’s Day). Each page marks one day of the year, from January to December. It’s a quick and colorful read, full of quotes, asides and traveling tricks for tourists who want to feel like locals. If it was larger in size, I’d call it a coffee table book. I’ve scribbled a few of her quotes into my own journal. I’ve also started writing in my journal again, inspiration from McLeod. Granted, my little city is quite boring compared to Paris. There are still plenty of nooks and avenues to explore in our own worlds. MacLeod brings to life the mundane and background of the world we live in. The little aspects of the street we overlook or just don’t see. It helps to put the phone away when going out for a walk.